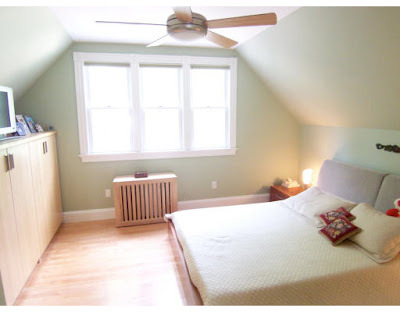 I figured I may as well finish up this series of posts on staging. 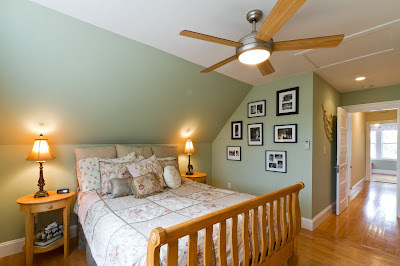 Since I showed you pretty much the entire downstairs I figured you probably would want to see the bedrooms as well. So here it goes. Our house has 3 bedrooms upstairs, and one bathroom. 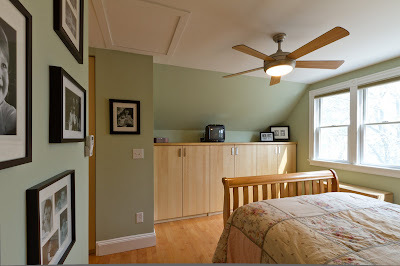 We use the largest bedroom as the master since we use the lower level bedroom as an office. Both of the girls have their own rooms. Tonite I will feature the Master Bedroom. When we moved in we did not change any paint colors upstairs. Therefore all the differences you see in these pics is SOLELY from staging. There is so much wrong with this. First off the photograph is awful, all bleached out. Secondly, I am pretty sure this photograph was trying to capture the closet space and built ins, but the angles are just not showing the room in it's best light. And finally, there is a space heater in the room. BIG RED FLAG. Yes, it is true, the money pit is a heating nightmare and the bedrooms do get really cold, but you don't want to point that out to your buyers! There are some additional minor things I dislike about the way this picture is staged. The two prints on the wall are undersized and it is strange that one has a thick framing mat around it and one does not. All the electronics and bric-a-brac on top of the built in is also very unappealing. It could be worse, but it could be a lot better. After: We have a very high bed. 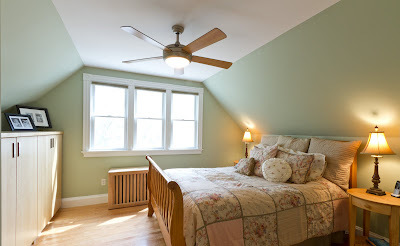 The bedside lamps throw extra light in the dark back corner of the room and their vertical outline draw your eyes up so you don't notice the slope of the walls. Extra pillows on the bed give it a more luxurious feel. All the frames on the wall are different but they contain black and white photos of the kids. You often hear that you need to depersonalize your house when selling because you want the buyers to feel at home there. I believe that is true in common spaces like living rooms, dining rooms etc. But in the bedrooms I like to leave personal touches. Our target buyers were going to be families (since we have a 4 bedroom house). We wanted to make it seem like this house was a good place to raise kids. That is also why we left the kid's rooms staged as little girls' rooms instead of depersonalizing one into a guest room. By keeping everything black and white (which works as a neutral) the photographs don't become distracting. If I had my preference we would have got rid of that TV for staging, but hubs vetoed that. We did get rid of the VCR and DVD player so there wasn't a big distracting tangle of cords. Instead of the angle (away from the windows) the previous sellers used, we chose to shoot into the window. 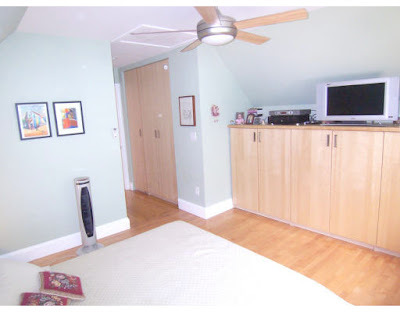 It is one of the big selling features of this room, and although you don't see all the closets, you see the built ins and get the idea that there is plenty of storage. So that is the master bedroom. Clean, neutral and well lit.